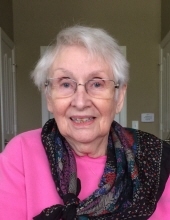 Bettie Jane Coburn Dickerson, 85, of Murfreesboro, Tennessee, passed away on February 8th, 2019 in Hendersonville, Tennessee due to complications following a series of strokes. She was the wife of Kermit Lee Dickerson, to whom she was married fifty five years. She was born on January 21st, 1934, her life beginning in a white, eight room house two miles outside of Robersonville, North Carolina. During her life, she would move many times, but her heart would always be strongly drawn to the old homestead..
She loved returning home to Robersonville and telling family stories to her five children. Sitting on the front swing with one of her babies lying on her lap, Bettie would make the farm sound like a magical place. In late summer, she took in the fragrance of tobacco curing in the two barns across the road. In fall, she would send her children outside to fill a grocery bag full of Papershell and Stuart pecans. And in the winter, she loved standing with her sisters close to the kerosene space heater in the den. In the spring, she would join her daddy, and pick and eat sweet strawberries from the garden behind the house. She could take great joy and place much value on things that most people would consider insignificant. Never really caring about wealth or prestige, or fashion or position, she made dear friends from all strata of society. She loved the share cropping neighbor lady, Seretha as much as the successful doctors, lawyers, mayors, and high society friends she held as close friends. She was always reading and growing in knowledge. And by doing so, she instilled in her children a desire to learn and appreciate joy in discovery. Until the very end, there was a sparkle in her eyes and a smile on her lips when she learned something new. She was a safe haven for not only her children, but many other young folk she took under her care. She epitomized sacrificial and unconditional love. When others were critical, she could turn a conversation in a positive way; always find redeeming traits about the criticized person. In dark and difficult times, she provided hope and comfort like no other. Her gift was giving direction to wayward souls and comforting broken hearts. Bettie began her relationship with Christ after a revival at the First Baptist Church in Robersonville. Interestingly, her baptism record showed she was baptized on June 23, 1950. She was a newly wedded 16 years old when this happened. And, four days later, her husband, Kermit, surrendered to Christ, and he, too, was baptized. Even then, she had a profound influence on those most close to her. Her ancestors were some of the earliest settlers of Tyrell, Pitt and Martin counties. And she was always interested in their history. Her strong lowland Scottish roots can be proven, all the way back to a 13th century ancestor, Sir Alexander de Cockburne, Baron of Ormiston. In May of 2018, she became a member of the Captain William Lytle Chapter of the Daughters of the American Revolution, taking pride in her ancestor, Edmund Andrews, who during the Revolutionary War was a member of the Pitt County Committee of Safety and a leader in the Flat Swamp Primitive Baptist Church. Bettie was preceded in death by her parents, John H. Coburn and Eva Idell Stevenson; and sisters: Geraldine Etheridge, Margaret Lou Coburn, Eva Ann Steele. She is survived by her children, Douglas (Barbara) Dickerson of Murfreesboro, Tennessee, Terrence (Marcia) Dickerson of Lavergne, Tennessee, Lee (Barbara) Dickerson of Collegedale, Tennesee, Susan Elizabeth (Bill) Farwell of Hendersonville, Tennessee, and Amy (Korey) Copeland of Bowling Green, Ohio, 11 grandchildren: Jason Dickerson, Hannelore Dowell, Luke Dickerson, Joshua Dickerson, Holly Dickerson, Erin Dickerson, Christopher Dickerson, Katherine Dickerson, Robert Hensley, Sarah Amburgey, and Griffin Copeland, three great-grandchildren: Aynelise DeHoff-Dickerson, Davis Dickerson, and Anslee Dickerson; sister, Christine Davenport. Visitation with the family will be 9:30 to 10:30 AM, Saturday, February 16, 2019 at Wilkerson Funeral Home, Greenville, NC Funeral services will be at 11 AM, directly following visitation. Burial will follow in the Robersonville Cemetery. Jason Dickerson, Joshua Dickerson, Luke Dickerson, Christopher Dickerson, Robert Hensley, Korey Copeland, and Griffin Copeland will be serving as pallbearers. To send flowers or a remembrance gift to the family of Bettie Jane Coburn Dickerson, please visit our Tribute Store. "Email Address" would like to share the life celebration of Bettie Jane Coburn Dickerson. Click on the "link" to go to share a favorite memory or leave a condolence message for the family.